Together with INDIAN ORNAMENT, HAWTHORN is the oldest pattern in our Booths inventory, produced by the firm of Thomas G Booth between 1876-83. 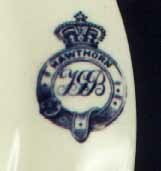 Note the impressed mark "TGB IRONSTONE" which harks back to an earlier era, before the introduction of the famous Booths Silicon China. 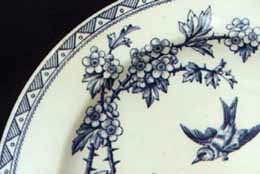 Both patterns are produced on a heavy, thickly potted body, although whether this is actually genuine ironstone is open to debate and would depend on the chemical composition of the materials used. 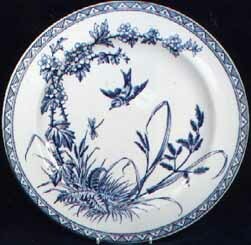 The elegant blue and white HAWTHORN pattern features a flying songbird chasing a butterfly, surrounded by a sawtooth-motif border. It is occasionally found in black (see the dessert plate below). There also exists a hand-coloured version on a brown transfer, but the examples we have seen of this do not feature the sawtooth border which sets off the central motif so well. Frederick Booth was Thomas Booth's half- brother, owner of the China Rooms in Bradford until joining the Booths business in 1883. 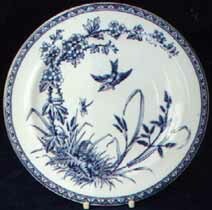 To view Indian Ornament, another early blue & white pattern from the firm of TG & F Booth (1883-91), click here.